Junji Ito is renowned as a prolific author and artist of horror, from individual short stories to multi-volume graphic novels. His continued success in this genre is probably due to his skill at evoking both psychological distress and visceral disgust; this is evident even in plot summaries of his stories, and his unsettling drawings greatly amplify the effect. While I would be interested in reading a critical analysis of one of Ito’s horror manga, though, I want to examine one of his works which is notably not horror fiction. 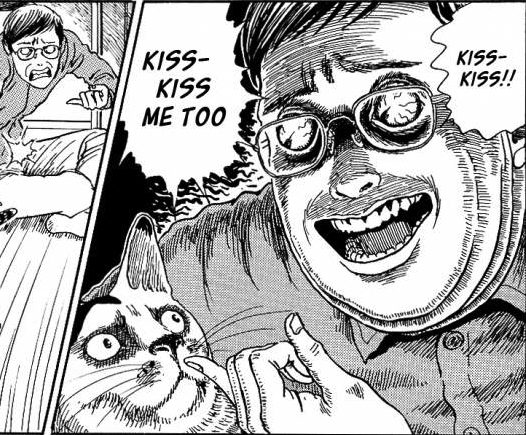 Junji Ito’s Cat Diary: Yon & Muu is a mostly-true account of Ito and his fiancée (now his wife) adopting two cats. It is also a comedy. J-kun, the protagonist and Ito’s autobiographical stand-in, sees the kitten Muu for the first time. Cat Diary has not been published in English at this time, so I am relying on an unofficial translation by /a/non scanlations and DKThias (who no longer appears to have a website), hosted on mangareader.com. Their translation of a tagline on the book’s back cover is, “The difference between fear and comedy is paper-thin.” While the emotions of fear and amusement are very different, horror writing and comedy writing often have a similar structure: both generally rely on build-up to an eventual revelation, which is the climax of a horror story or the punchline of a joke. The humor in Cat Diary consists more of quick gags than punchlines following long build-ups, but the elements of suspense and surprise that Ito uses so well in his horror comics is certainly present here as well. Don’t put your finger in it! Haven’t you ever seen a horror movie? The revelation that follows the sequence above is that J-kun’s cat Yon has a cold and has been sneezing on the floor. While cat mucus is not exactly terrifying for most people, this type of sequence, in which a character discovers and investigates a strange phenomenon, is very common in horror fiction. Horror also tends to include varying degrees of bizarre and grotesque imagery, and Ito’s horror comics generally feature these elements prominently and effectively. Grotesque distortion of human and animal figures can be very unsettling. However, bodily distortions of cartoony characters have been widely used for comedic purposes in comics and animation – the bodies of “Looney Tunes” characters, for example, are often bizarrely contorted by emotion or injury, with this being a visual joke. What, then, causes a cartoon character to be “funny-looking” as opposed to visually disturbing? That’s a much broader question than I can hope to answer here, and it’s also highly subjective; I’ve heard people criticize horror comics and movies on the basis that the creatures in them looked absurd enough to be funny rather than scary. The art style in Cat Diary seems to deliberately play on this subjectivity. Ito draws the same types of grotesque humans and inhuman entities that he draws in his horror manga, but in a very mundane context. J-kun expresses affection; Yon is not impressed. 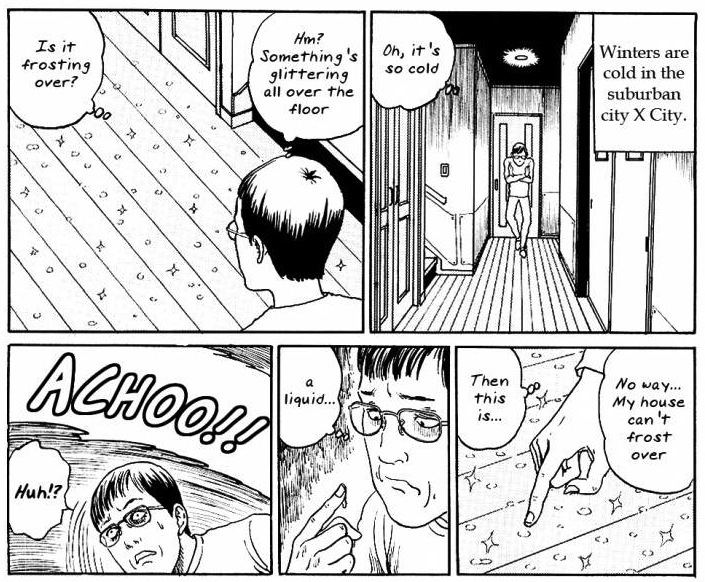 Since the reader knows that Cat Diary is the work of a creator who specializes in horror, the unsettling art style becomes part of a kind of contextual joke: Junji Ito makes horror comics, even when they’re actually humor comics about his real-life experiences with cats. The fact that Ito draws his autobiographical character as the most grotesque figure of all also contributes to the self-deprecating humor that runs throughout the comic. I think Cat Diary is a very entertaining manga, especially for its genre-crossing nature. I hope to see an official English-translated release soon. I’d also be interested in seeing other comic creators’ experiments with genres unfamiliar to them, but I think this would remain one of the most successful results. This looks amazing. I’m the first to admit I don’t read much manga, but I do “enjoy” Ito’s work from time to time — it’s among the creepiest, most unsettling work I’ve seen in any medium. Haha, that does sound like exactly the kind of thing that could happen in an Ito manga! The scanlation is , and I apologize for not linking to it in my post; I wasn’t sure about proper etiquette for linking to comics at unofficial sources. Sorry about the formatting error. I sure don’t know how to use the “title” html tag. I’m a huge fan of Junji Ito’s work. If you’re looking for something of his that’s been brought over to the U.S., I recommend picking up “Uzumaki.” It’s only 3 volumes, so it’s rather cheap, and it’s fiendishly fun. I’d let somebody borrow my copies, but sadly they are at home on my bookshelf right now.